I have very mixed feelings about the illustration. The official merchandise page also added a handful of new items recently. A mini Sengoku Basara Judge End 'artket' (decorative blanket) with its own case. It will be priced at ¥3,500 and released on 19th February 2015. AmiAmi is already listing it so it should appear on other import sites soon. Next, there's a set of 66 different trading cards including 'SP' (special) rare cards, 'SP' (special) cards, story cards, character cards, mini character cards and more. Each pack of 9 cards will cost ¥500, or you can buy a box containing 8 packs for ¥4,000. They'll go on sale in late February 2015. 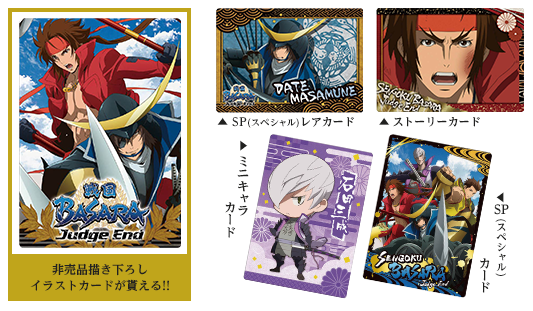 There will also be a Sengoku Basara Judge End A4 storage folder priced at ¥1,200, due for release on 31st January 2015. AmiAmi, Otaku Republic and CD Japan already have their preorder listings ready. 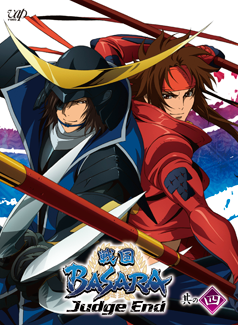 I know this looks very similar to the Sengoku Basara Judge End photo folder from the other day, but it's a different item, I promise!